>McGlathery Island Maine, just off of Stonington. A favorite place. >One of my favorite places to visit in Maine is the island of McGlathery, located just under three miles south east of Stonington Maine. Brenda and I have been visiting the island for nearly 20 years as we have explored many spots along the Maine coast. Stonington and McGlathery are both located in Merchant Row, a collection of islands that were once a hotbed of granite quarries that were teeming with commerce prior to the introduction of concrete as a preferred building material. 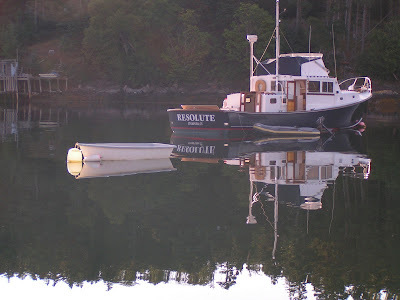 While there are a number of sheltered anchorages in the area, McGlathery is one of my favorite because there is a cove on the northeast side of the island and a gently sloping beach that’s easy to land on. This satellite photo of the island clearly shows the cove on the north east side and it’s well protected from the prevailing winds as well due to the tall pine trees covering the island. The island is owned and managed by the Island Heritage Trust, a group that’s dedicated to preserving islands like McGlathery for all to enjoy. The island is also a popular spot to visit with sea kayakers and is highly recommended by www.paddletrips.net. Here’s a link to the specific part of their site about the island and features a good map of the area. 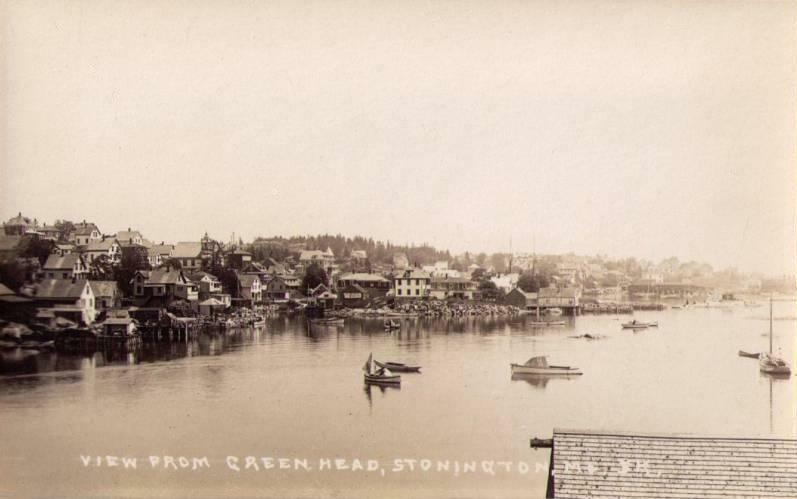 Even though this photo was taken nearly 100 years ago, Stonington doesn’t look a lot different now than it did then. However, there are a lot more boats in the harbor and they are nearly all lobster boats. This link gives an interesting history of the area. Nearby is also Crotch Island, named because of a slot in the middle of the island that makes it look like a pair of short pants. It is the only currently active quarry in the area and has supplied granite to many notable sites in the US. In particular, it’s stone has been used in the George Washington Bridge, Kennedy memorial in Arlington as well as a recent installation in the New Yankee Stadium. This is an interesting article about Yankee Stadium and Crotch Island’s involvement. 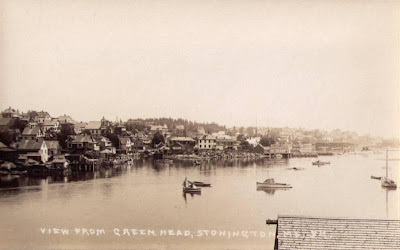 As I look at this photo of Stonington above I believe that it was taken from Crotch Island itself. >In response to my last few posts, my friend Tom from Marblehead MA wrote me to suggest that I write about one of his favorite places to visit in Maine, Frenchboro. It is indeed a great spot and one that I really like to visit as well. Frenchboro is a great stopping place if you are headed east from the Boothbay area on your way to Bar Harbor. It’s located just south of Swan island and is one of the outlying islands that is inhabited year round. Frenchboro is the name of the town itself (the only one actually) and is located on the island of Long Island. It’s quite remote and there’s no place to buy groceries or get fuel. However, there is a great dockside restaurant where you can get a wonderful lobster dinner overlooking the harbor. You can even top off your meal with a great piece of wild Maine blueberry pie made there. The town has a nice website that’s worth checking out. Getting to Frenchboro is easy by boat but if you don’t have a boat you can still get there by ferry which runs a few times a week. During the summer there is also a tour boat that goes out of Bass Harbor and includes a hike on the island. To that point, while the island is small, there are a number of very nice walking paths that you can take to get a good feel for the island. A considerable amount of work goes into keeping year round island life vital in Maine and Frenchboro is at the forefront of that effort. The town has had an active homesteading effort to bring young families to the island over the years. I expect that it’s not an easy place to live at any time, most specifically in the winter when access to the mainland is so limited. According to Wickipedia, there are only 11 families living on the island. I guess that’s the year round population as there are more than that many homes. Living near New York, it’s hard for me to imagine what it would be like in the winter out there with only two ferry runs per week and about 10 families to hang out with . I’ll bet that the dynamics can get pretty interesting at times. Need milk? Actually, need beer? The ferry from the mainland only runs twice a week year round and has an extra trip in the “warm” season. There’s a convenient link on their home page to the Maine State Ferry schedule. There is a great library on the island (given the sized of the population) and it’s worth making a stop to take a look around. There are some local crafts for sale and it’s a nice place to hang out for a rest. The also have a computer where you can check for your e-mail too. If you want to learn more about this fascinating island and it’s rich history you should get a copy of the book Hauling by Hand, a history of the island and families that have lived there for ever. This book was written by a member of the Lunt family from whom many of the inhabitants are a member or descend. It’s well written and exhaustively researched. If you love Maine, you will want to read this boo. It is available from Amazon or you can visit the Frenchboro library and purchase a copy there. To say that this is a scenic place doesn’t begin to describe how beautiful the island and it’s homes are. 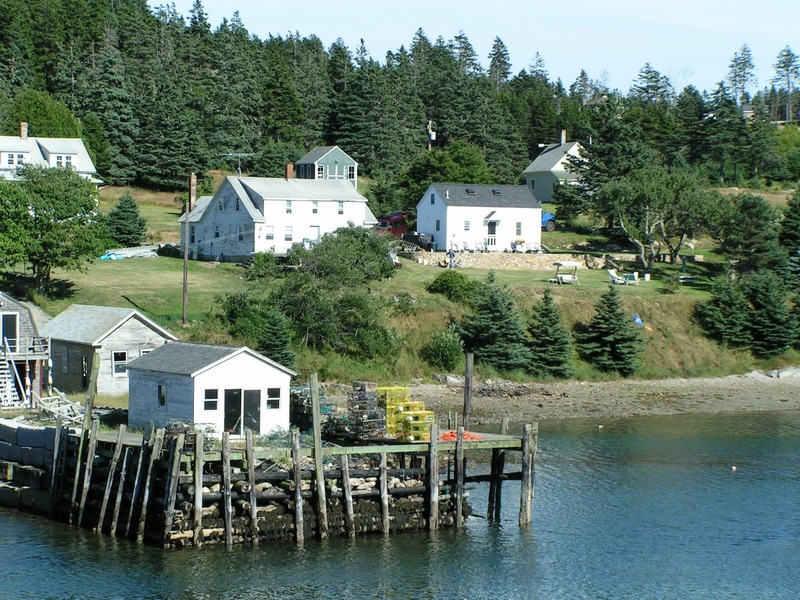 Unlike so much of the Maine coastal areas, most of the homes on the island are modest and many are occupied year round by fisherman. Even the clutter on the island is scenic. This is a particularly colorful pile of lobster buoys and such a contrast to the white painted homes. 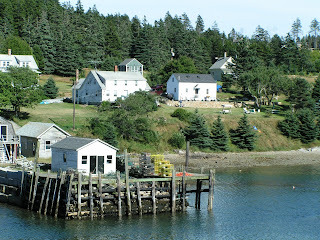 The harbor is very well protected and has a real feel of old rural Maine in the architecture. You can rent a mooring for $25 in the outer harbor which is quite calm and very close to the town dock. On top of that you will be treated to a fabulously peaceful view first thing in the morning. It doesn’t get any better than this. Yet another wonderful view. What a contrast of red and green. I am fairly certain that this photo was taken at Frenchboro. So many wonderful photos. The rest? Yes, I am certain where they were taken. Scout’s honor. I would be remiss if I didn’t mention the Frenchboro lobster festival which is held each August. Brenda and I have not attended as there always seems to be a conflict with some other event that we want to attend. However, I am told that it’s a great time and the one weekend of the year that the island really hops. We hope to make it this year. As I write this I wasn’t able to find any reference to a date for 2011. I can’t wait until spring and Pandora goes back in the water although that seems a very long way off right now as it’s only 34 degrees out right now. At least I can write about the great places that we will visit. Here’s to an early spring.